This entry was posted in Atlanta Braves, Buffalo Bills, Calgary Flames, Hartford NHL team, Oakland A's, Olympics, Rochester Americans, Washington Mystics, Washington NFL team, Washington Wizards by Neil deMause. Bookmark the permalink. While the Coliseum is a sure thing for a new ballpark, the income potential is notably less than HT (being in the middle of low-income/industrial East Oakland will do that). The A’s can still get some income from it, but they don’t think it would be enough of a payroll boost to pull themselves out of second place in the local baseball market. The potential development income at HT is obviously higher (next to downtown/Jack London Square), but comes with a notably higher cost in money and red tape. The city and county own the Coliseum jointly, while HT is owned by the Port of Oakland (associated with but not answerable to the city). Alameda County wants out of the Joint Powers Authority, but the city has recently said they don’t have the money to buy the county out. The A’s in March offered to cover all the debt on both the Coliseum and Oracle Arena in order to obtain the property, and there are rumbling that the A’s are negotiating with the county for at least the county’s share of the JPA. The A’s are thinking big: if they can get HT for a ballpark and some accessory development *and* the Coliseum, they’ll have a extra backup income source not tied to HT development to fund the team. The Giants are a sinking ship, success-wise, and the A’s want make the most of the opportunity provided by having a young, skilled, hard-hitting team while looking to open the new ballpark within 5 years. Target is local baseball market dominance, but it’s an uphill fight as most of the local sports media has it’s hand in the Giants’ pockets (30% ownership of local NBC sports affiliate). They’d have twice the land costs, too, though. This sounds a bit like combining two money-losing proposals and figuring you’ll make it up in volume. This is not how billionaire sports franchise owners work. If it were, the current A’s ownership could just use GAP generated funds to fill any A’s operating shortfall (if such a thing exists, which I highly doubt). If “A’s ownership” should ultimately get control of both sites, I think you can bet that separate companies will control the two sites. The parent company of both organizations might use profits from one division to offset losses from another for tax purposes in any given tax year, but there will be no subsidy from one company to another in perpetuity. Wolff (years ago) suggested a model something like this to try to build an MLS stadium, but that version of “sell me this land for peanuts, then rezone it to my spec and I’ll sell it on for a huge profit and turn the proceeds into a stadium” was very different than what the A’s have proposed thus far. So far as I know, the club is still saying they will pay for stadium construction themselves. 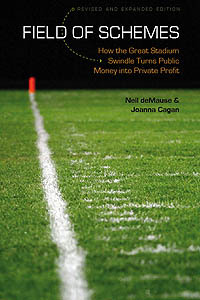 Since the DC United deal was done for the sole purpose of bringing back the NFL, I would argue that the value of the free land is actually an NFL subsidy. Getting the Skins to pay 100% of construction costs I don’t see happening. So basically in Columbus they will tax Crew fans to pay for the Bluejackets new scoreboard. Fools wonder why that team has to leave Nationwide Ohio. I agree that the Skins won’t pay for 100% of anything, but DCU was probably done to give pols a way to appeal to different voters than the NFL would—along with the belief that sports bring wealth. The NFL has been gone from DC for so long that it’s really just older folks who really think RFK was awesome. No new stadium will replicate that atmosphere. you clearly didn’t get the author’s point on ticket taxes. Do you think Columbus is the first/only city to do this? Earlier in the week, Seattle’s New Arena with Oak View Group had a Final Environmental Impact Statement that was opposed by nobody, officially, by the filing deadline. That’s often something that adds months (or a large chunk of a year) to a project. There was also a city council committee meeting on Friday that I’ve not yet studied up on. Sapporo Japan just pulled out of the Olympic bidding for 2026 and post-election Sweden is less interested. It may come down to two cities again just like 2022 (Beijing and Almaty). For example Turkey is bidding and even if keying their current security and human rights situation, they have never won a winter Olympic medal.